Trudi and her family came to the United States when she was just five years old because Martial Law had been declared in the Philippines. She later studied art at the Cleveland Institute of Art and then spent over 20 years working in Graphics Production. In March of 2014, Trudi decided that she wanted to transition into a more fulfilling career – Emergency Medical Services. 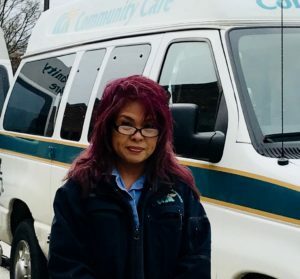 She became a Wheelchair Technician at Community Care Ambulance, so that she could assist people in their discharge trips and pre-hospital travel. Trudi always makes sure that she leaves her patients with the lasting impression that she truly care for them. She anticipates and strives to understand the unique needs of patients and customers. Our wheelchair technicians demonstrate personal commitment to the organization’s core values, and Trudi goes above and beyond. Trudi’s coworkers describe her as someone who puts patients before herself, ensures that patients are kept comfortable and safe at all times, always has a positive attitude, and someone who brings a smile to everyone she meets. In her spare time, Trudi enjoys spending time with family, cooking, and watching movies. She is also known to sing for weddings, and was once the lead singer in a Journey cover band. Trudi is nominated as a Star of Life in recognition of her dedication and commitment to providing the highest-quality service to each person she meets and helps every day.